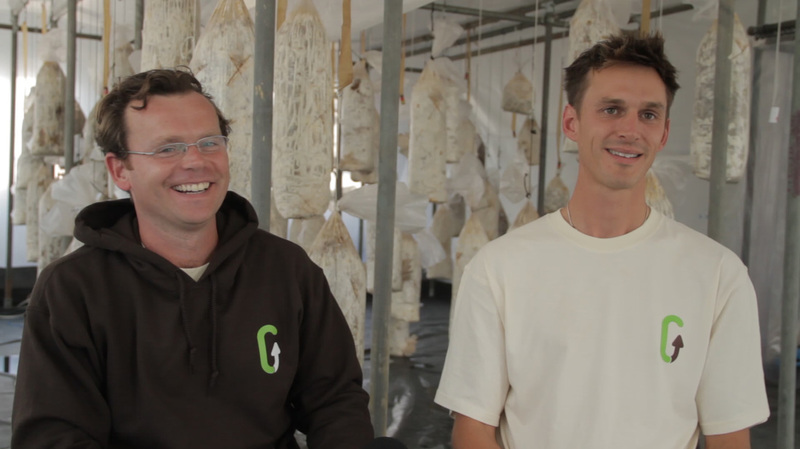 Adam Sayner (right) and Eric Jong of Totnes, England-based GroCycle explain how their ingeniously regenerative business model for cultivating mushrooms — piggybacking off the role mushrooms play as extraordinary providers of ecosystem services and utilizing the waste streams of coffee shops and breweries — could one day be a means for producing this protein-rich food at low cost in urban centers throughout the world. Adam Sayner’s love of mushrooms dates back seven years to a hobby he took up while attending the University of Sussex, when he began foraging wild mushrooms in the surrounding Devon countryside. When the foraging season ended, he followed his nascent passion and began cultivating them indoors. After university, Adam established a small, thriving business supplying mushrooms to local restaurants around Totnes, home of Schumacher College and the “cradle” of the now-famed Transition Network movement. In 2012 Eric Jong, a native of Holland and former employee at ExxonMobil and EDF Energy, joined him in this mushrooming enterprise. Eric had decided to embark on an alternative course, to be "part of the solution," studying sustainable horticulture at Schumacher College. 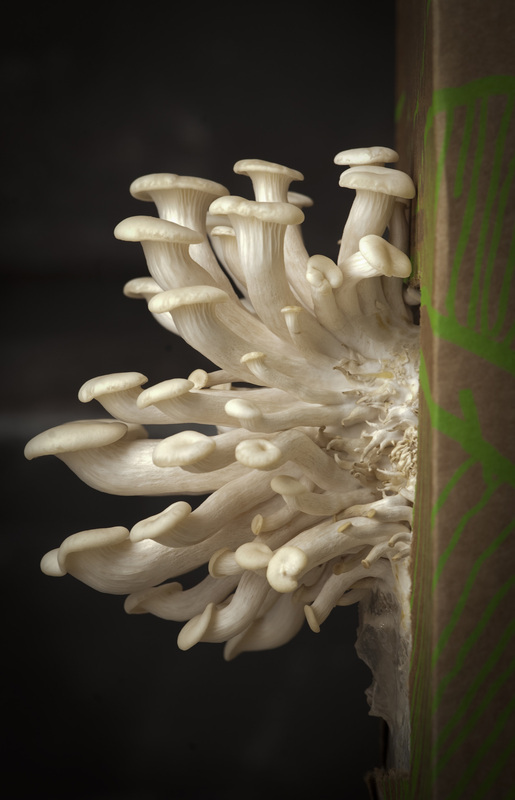 Adam began by cultivating mushrooms the traditional way, using straw, a compost mix, or woodchip sawdust, all of which require careful sterilization before they can be used as substrate. Searching for a way to reduce the cost and energy consumed in the cultivation process, he lit upon the idea of using as substrate coffee grounds that were otherwise discarded as waste by the proliferating coffee shops of Totnes. “Energy was already being expensed to sterilize the coffee grounds in the cafe's espresso machine,” Adam reports. Adam and Eric now operate GroCycle, a Community Interest Company that sells DIY gourmet oyster mushroom kits for the home cultivator. The Community Interest Company corporate form was created in the UK under the Companies Act of 2004 to recognize for-profit companies that have a stated purpose beyond profit. Enterprise owners can make up to £60,000 per annum without challenge; beyond that amount they must seek justification for their compensation from regulators. “We are not surviving off grants and donations,” Eric explains, “we are aiming to be a business, but all the profit we make must go into our social and environmental aims.” GroCycle also operates a vertical urban mushroom farm in an abandoned office building in downtown Exeter. Taking their exploitation of what would otherwise be waste streams even further, they are now growing their own mushroom seed [spawn] from the spent grains and hops collected from local breweries. “What mushrooms do in nature, and have spent millions of years evolving to do, is to break down and reuse complex materials that otherwise we have no use for,” Adam explains. “The role they play is fundamentally to recycle nutrients back into nature. As the price of meat continues to rise, the demand for alternative, protein-rich food sources like mushrooms are expected to rise in tandem. “The limitations of this growing system is that you need to use the coffee grounds when they are very fresh and coffee shops are proliferating in almost every urban centre. So it is a natural fit for growing a localist urban food system," says Adam.